It’s hard to enter the vale of Grasmere and not think of William Wordsworth. The village is dominated as much by the poet as by the contours of the Lakeland mountains. His old homes of Dove Cottage and Rydal Mount have long been open to the public, but they now have a relatively new companion in another former home, Allan Bank. Wordsworth seems to have had more Lakeland homes than you can shake a stanza at. Dove Cottage is the most stereotypically poetic, the sort of white-walled slate-roofed idyllic cottage that could be advertised for a grand a week in the Cumbrian cottages brochures of today. The Dove Cottage experience begins with the Wordsworth Museum, set in a new building made of local slate. It contains a number of portraits of Wordsworth and his fellow Lakeland poets, Coleridge Southey and de Quincey, and gives a sense of how, as with most writers, finances were always a concern. Downstairs there are interactive areas. My 19-year-old daughter Lola and her friend Katie forget woke politics for a minute and delight in donning Wordsworthian jackets and hats, making hand on chin poetic poses for an iPhone selfie. 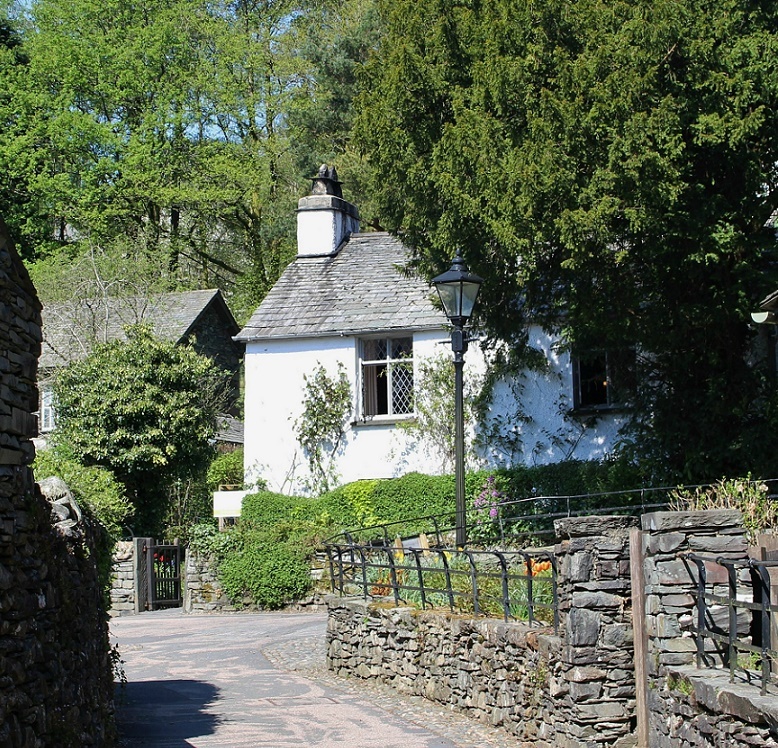 We take our place for the guided tour of Dove Cottage, which was Wordsworth’s home from December 1799 to May 1808. Twenty or so tourists stand in the reception room. It used to be a pub and that’s why the first two rooms have wooden panelling and slate floors. It’s dark but cosy. Above the mantelpiece is a picture of Peppa, the terrier that Sir Walter Scott gave to the Wordsworths. Apparently Scott had a bit of a dog habit, arriving with dogs and dispensing them to hosts as he travelled. A stream runs under the floor of the pantry, acting as an early fridge for the poet’s food. “And this is Wordsworth’s coffee grinder,” says our guide, pointing out the wooden box with a metal grinding handle by the kitchen parlour’s window. Coffee would have been a luxury then and it would only have been used on special occasions. But it’s hard not to imagine William as a hipster barista of his time, sipping Cumbrian cappuccino with his poetic mates. The Journals of Dorothy Wordsworth give a vivid picture of life at Dove Cottage. Dorothy cooks a lot of porridge and lamb chops for William. She studies flowers and enjoys the garden. Dorothy’s life is blighted by migraines, William is often ill too. Coleridge visits and leaps over the garden gate. The trio take lengthy walks outdoors and discuss poetry and the French Revolution. De Quincey and Southey drop in. Everything is geared towards William’s poetry, with Dorothy transcribing his verse and inspiring him with her description of dancing daffodils. He’d tried Cambridge, London, the Alps and revolutionary France, but here he’s found his mountain mojo and a soul mate in Coleridge. His imprecations of “O Friend!” in The Prelude still move me. There’s a lovely anecdote recorded in The Ballad of Dorothy Wordsworth by Frances Wilson. While living at Alfoxden House in Somerset, William, Dorothy and Samuel Coleridge spent so much time going on long clifftop walks and looking out to sea while discussing metaphysics that the locals feared they might be anarchists spying for the French. Really they were just a bunch of hippies, getting it together in a house in the country. When I first met my wife she was hanging out with a set of greens in Oxford, a set of intellectuals who spent a lot of time discussing climate change and carbon footprints. They played ultimate Frisbee but didn’t have any time for the commercialisation and tribalism of football. In many ways Wordsworth and his set of radicals must have been quite similar. There’s also the question of just how deep was William’s love for Dorothy. Modern scholars have written reams speculating about a possible incestuous relationship. They lost their mother at a young age and then their father, after which Dorothy was sent to Halifax. So they didn’t know each other during childhood and when they met again, each became a kind of substitute parent for the other. When William married Mary Hutchinson, Dorothy collapsed on the day of the wedding. Much was made of Dorothy’s journal entry where she describes sleeping wearing her brother’s wedding ring the night before the marriage and writes that William “blessed” her twice. Though I’d like to think that most academics are just a bit over-zealous in their interpretation and that William and Dorothy just enjoyed a particularly close bond as writers (frustrated in Dorothy’s case), lovers of nature and orphans. Whatever the truth, Dove Cottage still feels like they’ve just left. You can feel the darkness of overcast Lakeland days, the cosiness of sitting by the fire, the fervent discussions between the Wordsworth siblings and Coleridge, and sense how cramped it must have been once William and Mary began having children. Upstairs, Labour Party activists Lola and Katie are impressed with the socialist sentiments of Wordsworth’s quote, “Men who do not wear fine clothes can feel deeply.” We see his bed, his ice skates in a case and then the famous couch that is mentioned in his Daffodils poem. There’s not too much evidence of the three young children William and Mary raised here, though the bedroom over the buttery was a nursery and is wallpapered with yellowing copies of the Times, dated 1800. This was an attempt at insulation, and it also suggests the trio might have been a bit bohemian in their attitude to home decor. Elsewhere a cabinet displays a laudanum pipe used by Coleridge, always the Keith Richards to Will’s Mick Jagger. The Wordsworths left in 1808 and the following year their poet pal Thomas De Quincey rented it. In his Confessions of an English Opium Eater De Quincey describes chillaxing at Dove Cottage with a quart of laudanum, as you do. He upset the increasingly conventional Wordsworths by altering the house and garden and publishing a little too much detail in his essays, Recollections of the Lake Poets. In the garden Wordsworth’s lines of poetry are displayed by the flowerbeds, as if it’s literally cultivating verse. At the top of the sloping garden is the wooden platform containing a seat with a roof, built by William and his neighbour, and making a fine ‘writer’s shed’. Here William, Dorothy and Mary would sit looking at the then-unencumbered view of the lake and the terraces of Loughrigg Fell. As we sit in Dove Cottage’s garden platform overlooking Grasmere, Lola and Katie wonder if Wordsworth ever went on a Snapchat streak with Coleridge. “Maybe a laudanum streak,” I quip. 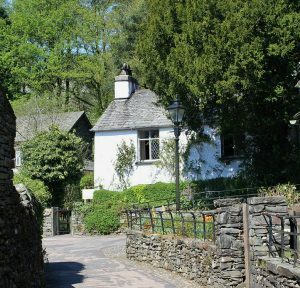 Perhaps the most interesting of Wordsworth’s former homes to visit today is Allan Bank, close to Grasmere on the path to Silver How. It was rented out by the National Trust until it was badly damaged by a fire in 2011. After basic repair work it was opened to the public in 2012, complete with undecorated walls and donated furniture. It all looks fashionably distressed. There’s no collections or portraits, but the visitors can use their imaginations instead. You can make your own free cups of tea and sit in any of the rooms in comfy chairs overlooking the fantastic views of Grasmere Island and Loughrigg. The Wordsworths lived here from 1808 to 1810. “Wordsworth had a lot of problems with the fires, the smoke kept blowing back into the rooms,” explains the National Trust guide. A bit like having poor Wi-Fi reception today, perhaps, though it seems a tremendous home to modern eyes. But another part of the Allan Bank story is that Wordsworth was the hero of Canon Hardwicke Rawnsley, who later moved into the house and was one of the founders of the National Trust. The wonderfully-named Hardwicke sounds an intriguing character, an Oxford graduate dubbed “the most active volcano in Europe” and “a peppery old swine” by his gardener. The house was smaller in Wordsworth’s time, but both Rawnsley and Wordsworth would have enjoyed the superb gardens, set against a series of rocky outcrops. Moss grows on tree roots and the dry stone walls. Visitors take a circular path that heads towards Victorian follies, a tunnel and a high-level stone viewing seat looking across to the Lion and the Lamb. After Allan Bank the Wordsworths then spent two unhappy years at the Old Rectory in Grasmere. It’s been demolished now, but saw the death of their children Catherine and Thomas and an estrangement with Coleridge over his drug use. Rydal Mount proved a much happier home. It’s an upmarket gaff, closer to Ambleside. Rydal Mount is set above St Mary’s church, where Wordsworth was a warden, and opposite the grounds of the 16th Century Rydal Hall. It’s the house of a man who has made it, without any of the dinginess of Dove Cottage. William Wordsworth lived at Rydal Mount for 37 years, finding contentment in the “happy gardens” until he died in 1850. In the dining room is a portrait of Robert Burns — the two poets met and shared a belief in writing about normal farming folk. The drawing room is spacious with French windows looking out at the gardens, designed by the poet himself. Above the fireplace is the only known portrait of a middle-aged Dorothy, whose devotion so helped to inspire her brother. The adjoining library is full of learned tomes. “The library is here, the study is outside,” remarked one of William’s servants. Though it was here that Wordsworth probably got too comfortable. Dora Wordsworth once described it as “Idle Mount”. It was said by a friend that Wordsworth had “three wives” in Mary, Dorothy, and daughter Dora. If Dove Cottage was his punk period, fresh from walking the Alps and visiting the French revolution, Rydal Mount was his more AOR period, when the poet went mainstream. On the wall of William and Mary’s bedroom is a framed copy of Wordsworth’s letter to Queen Victoria declining her offer of being Poet Laureate. William writes, “The appointment I feel, however, imposes duties on me which far advanced in life as I am I can not venture to undertake and therefore I beg to decline.” In a victory for romantic slackers everywhere, the Queen replied that Wordsworth wouldn’t have to write any poetry. He then accepted, dutifully not writing to order, the only poet Laureate who has got away with no workload of odes. Every room has a fine view. You can see the waters of Windermere from Wordsworth’s bedroom and the squat grandeur of Loughrigg Fell. Listening to the sound of rain falling on leaves outside Dorothy’s window you sense what a great environment for cultivating high thoughts this must have been. Most touching is Dora’s room. It’s a small room with a creaking wooden floor and tiny bed. Wordsworth doted on his daughter, who from the age of 18 suffered from a latent form of tuberculosis. She married when she was 37 but six years later returned to Rydal Mount to be nursed by her mother Mary. She died in 1843 when William was 77 and he was distraught, saying, “She is ever with me and will be to the last moment of my life.” Fame could not protect even the most eminent Victorians from mortality. There’s something very human in the image of William and Mary, the grieving elderly couple, and Dorothy, now suffering from possible dementia, planting Dora’s Field, a field of daffodils below the Rydal Mount gardens. You can still enter Dora’s field via a metal gate from the church. It’s bracken, brambles and trees now with a lot of traffic noise, but on the circular path it’s easy to imagine William, Mary and Dorothy’s sad pacing among Dora’s daffodils. My final Wordsworthian trek is to the family graves at Grasmere Church. The family plot is surrounded by a low railing but remains pleasingly simple and free of grandiose monuments. I wasn’t prepared for the emotional jolt of seeing William’s simple grave next to Mary and Dorothy, with Dora close alongside. A single bunch of flowers has been left on his grave. Anyone who has read The Prelude or Ode: Intimations of Immortality will feel they know the man. A slumber did his spirit seal. He was certainly prescient in concepts such as the early years of childhood creating the adult character and nature healing troubled souls. What would he make of being next to the Wordsworth Hotel and Spa and the Wordsworth Daffodil Garden? The poet is part of a Lakeland tourist trap, yet also somehow undiluted by all the commercialisation. Wordsworth is quite a modern character, really. Today he’d be called Will, go off inter-railing, be dabbling in radical politics, trying to keep Sam Coleridge off the weed and probably running new age writing workshops by Rydal Water. He was, like most visitors of today, a man who loved the crags and tarns and the beauty of the fells, and also, for all his self-absorption, was a literary genius who broke down barriers and helped create the cult of nature. And now he’s part of his sacred landscape. This extract is from Pete May’s new book Man About Tarn: How a Londoner Learned to Love the Lake District. Pete May’s other books include Goodbye To Boleyn, Whovian Dad, The Joy of Essex, There’s A Hippo In My Cistern, Rent Boy, Hammers in the Heart and Sunday Muddy Sunday. As a journalist he has written for the Guardian, Observer, Independent, Daily Telegraph, Time Out, New Statesman, Loaded, Midweek and numerous other publications. He is an associate lecturer in Sports Journalism at the London College of Communication. He lives in London with his wife, two daughters, a dog named Vulcan and a collection of Wainwright guides. The picture at the top is an image of how the new ‘Reimagining Wordsworth’ project will bring the interiors of Dove Cottage closer to how they would have been when the Wordsworths lived there.